Furthermore, we can offer a set of document templates that are compliant with ISO9001 and ISO13485 which can be used as a basis for creating company specific policies and procedures to comply with the new regulation. 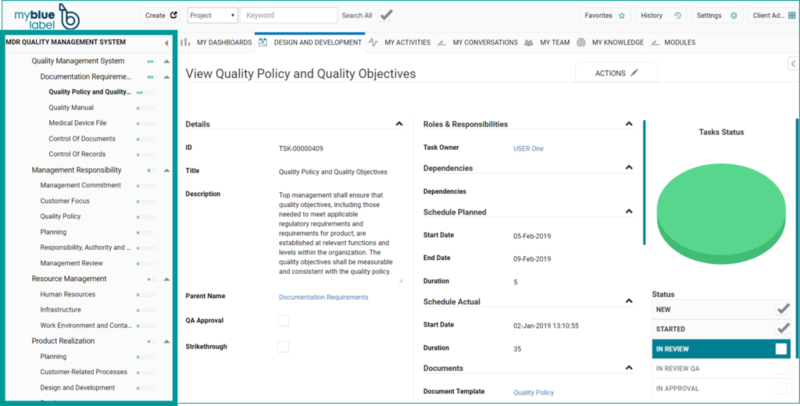 The template package includes a Quality Manual template, templates for standard operating procedures (see figure below) as well as IT system lifecycle management procedures to ensure compliance of the electronic document management system and quality management system over time. If all document templates are purchased the package costs 13.500 EUR, if you as a company have some procedures in place and only want to purchase a limited set of templates the price can be reduced. For the full implementation of the MyBlueLabel solution Pharma IT recommends including support for adjustment and extended training of the QMS to specific company standards (3 days), validation of the IT system (3 days) and end user training of the company in the use of the system (2 days). These services are optional and can also be performed by the company itself. If more support is needed this can be provided on an ad-hoc basis and Pharma IT can also provide support for maintenance of the IT system after implementation. 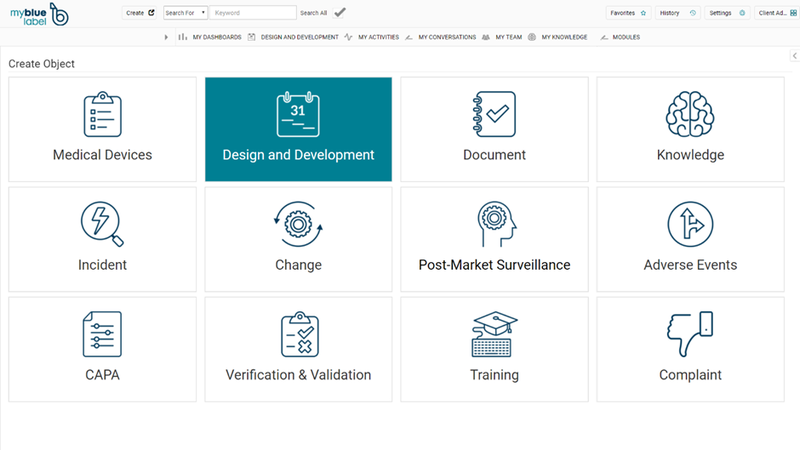 The document templates also come with a conformity assessment template that will guide you through the assessment of the device and thereby correct classification in respect to the new regulation. The new regulation requires additional information in respect to reporting of clinical investigations, post-market surveillance in respect to post-market surveillance plan, PSURs, reporting of incidents and trending reports. Pharma IT have an experienced safety and pharmacovigilance team from the Pharmaceutical Industry who is experienced in this line of work and based on an individual company assessment we can deliver the right service for your specific needs. Pharma IT can offer qualified personal which can be appointed both as Authorized Representative and Regulatory Responsible. The authorized representative will be responsible for products on the market and will support your company with internal audits and reviews to ensure proper management of Quality. The Authorized Representative will be legally liable for defective devices on the same basis as, and jointly and severally with, as the manufacturer. The Regulatory responsible will ensure compliance in respect to regulations from authorities. The person will be responsible for check of conformity of the devices in respect to the QMS before a device is released, check of the technical documentation and the EU declaration of conformity are kept up-to-date, check that the post-market surveillance obligations are performed and that the reporting obligations are fulfilled. 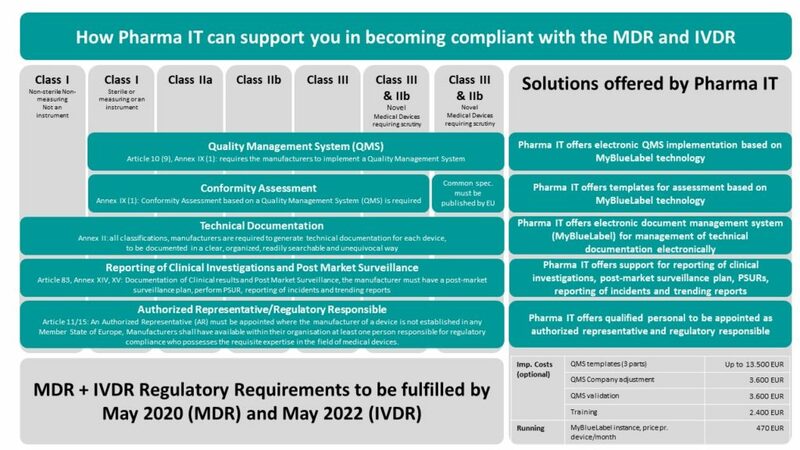 Should you find our turn-key solution for becoming compliant with MDR and IVDR by May 2020/2022 interesting please contact us via this link. If interested you can sign-up for free demo of the MyBlueLabel system and a 30 days free trial license.